The village sits between the Chamonix Valley and the Val d’Arly, but unlike nearby Saint Gervais and Megève, Les Contamines is spared through-traffic, since the road stops at the far end of the valley. Road access from Saint Gervais is simple enough, however, with no arduous mountain climbs. The location is impressive, nearby Mont-Blanc providing visual drama along with healthy snowfalls, while over in the next valley lie Hauteluce and the Beaufortain. Two gondola lifts converge on Etape 1470, from which you either take an onward chairlift to ski a selection of tree-lined terrain (for competent skiers this means all the way down to the valley floor) or a gondola up to Signal 1900. Here you’ll find terrain for all abilities, novices included. Lovers of Blue-graded cruising have a good selection of quite long runs, including a couple of scenic swoops over into the Hauteluce sector. 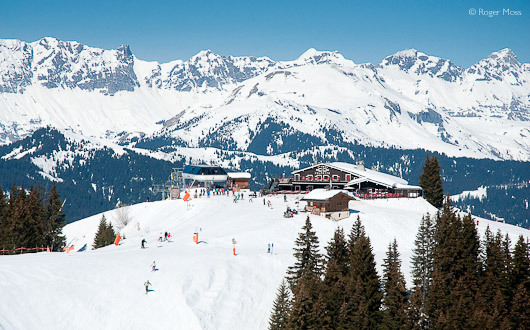 It’s more competent skiers, though, who get to appreciate the full extent of just what Les Contamines offers. Red-grading tends to be more a reflection of gradient steepness than anything too daunting - and often you can change your mind along the way and switch to a Blue. For something altogether more testing, take the draglift up to Veleray 2450 for bracing drop down to 1577m on the Black-graded Rebans. The old village has an appealingly authentic feel, and still has a reassuringly down-to-earth skyline. Les Contamines-Montjoie has been welcoming visitors since the first hotel opened in 1900, and founded its Ski Club just eleven years later. Chalet style still rules, with larger apartment developments only really in evidence (conveniently) closer to the Montjoie gondola. There’s also limited on-mountain hotel accommodation at Etape 1470. Shuttle-buses around the valley are free. 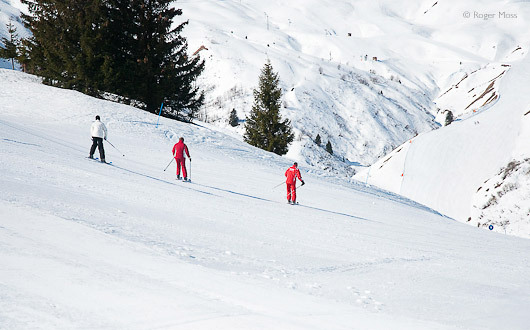 Why go skiing in Les Contamines ? Groomed cross-country trails for classic and skating style. Some challenging but safe steeps for confidence-building. Hauteluce sector adds variety and worthwhile extra mileage. Reassuring debutante areas, but relatively limited terrain for early intermediate skiers. No lift link to St Gervais/Megève - you'll need to take the bus or drive. La Gorge gondola offers ample parking plus a quicker ascent than Montjoie. 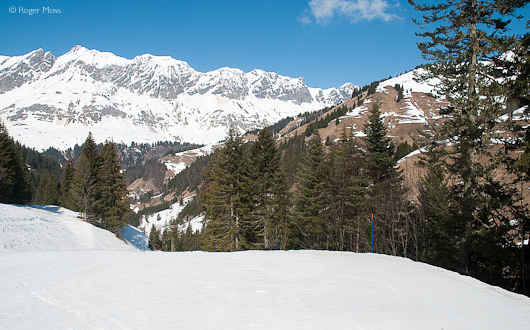 The Nature Reserve in Les Contamines-Montjoie is situated on the left hand side of the valley, between Dômes de Miage and Mont Joly. It was created in 1979 and covers more than 5,500ha at an altitude ranging from 1000 - 3900m. Forests, pastures, torrents, rocks, snow and glaciers offer a protected haven for diverse alpine fauna and luxuriant flora. In the village centre next to the Tourist Office, the nature reserve information team provides activities, exhibitions, kids workshops, and library. Open Mon-Sat 1000-1200 and 1530-1830, Sun 1600-1800. • Church of the Holy Trinity in the village centre, built in 1759. • The Church of Notre Dame de la Gorge situated at the end of the valley. • 14 Oraticals (or chapels) dot the path leading to the Church of Notre Dame de la Gorge. Local heritage guides can help you discover one of the Baroque churches, cost from €5. From the A40 l'Autoroute Blanche take the Le Fayet exit 21. 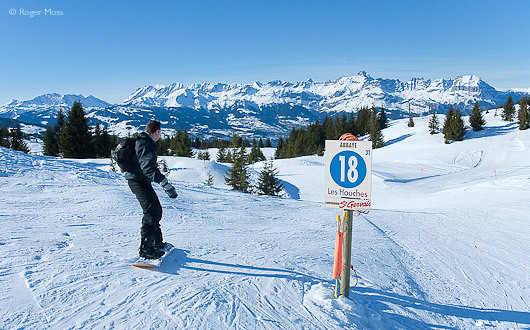 Go through Saint-Gervais and follow signs for Les Contamines (12km). The nearest airport is Geneva (1 hour) which can be accessed by bus or taxi. Chambéry Savoie Mont Blanc is about 1hour 15mins. 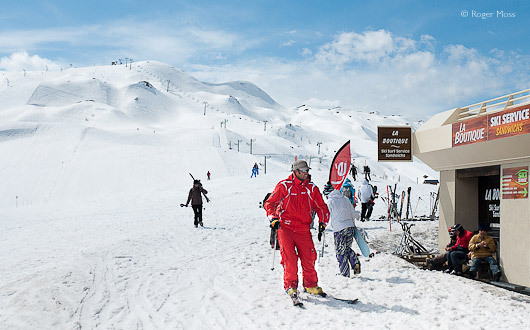 For bus connections see SAT MONT BLANC which provides links between Geneva, Saint Gervais / Le Fayet and Les Contamines. 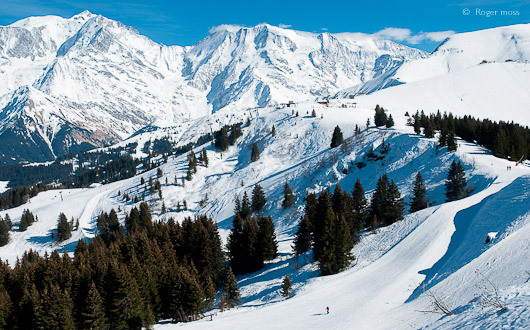 This couldn't be easier - travel by TGV direct from Paris to Saint Gervais Le Fayet then take a bus or taxi (12km). The weather forecast isn’t overly encouraging when we set off for Les Contamines, but we’ve heard so much about this place for so long that we’re not going to pass up an opportunity to ski here at long last. The drive round from our base in Combloux proves to be undramatic, unlike the scenery which greets us as we make our final climb to the village. We normal resist using words like ‘cute’ to describe ski villages but in this case there’s no escaping the fact that this is how it looks and feels at a first encounter. Judging by the beautifully-restored Baroque church rising from the skyline, it’s also very much a living and working mountain community with a lot of history. For now, though, we press on, driven by a desire to get up the mountain to the ski area and cram in what we can before a fast-approaching depression stops play. 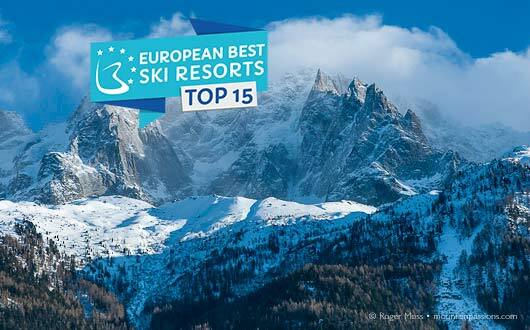 It all adds up to the kind of tantalising glimpse into just what this place offers skiers with the desire and imagination to try something just a little away from the mainstream. We have no problem at all parking at La Gorge, and are soon riding the gondola on a steep haul up through the forest to Etape 1470. From the top a Red-graded return run drops through the trees back to the base of the lift, but we transfer to a second gondola for a gentler ride up to Signal (1900m). So far there’s little more than a gentle breeze, but we know it isn’t going to last, so we ski down to take the Roselette chairlift to head up for a look at how the liaison with the Hauteluce sector works. At the top there’s a stiff breeze building, but the scenery falling away before us is even more breathtaking, so we decide to take the plunge and go for it on Choton, a steep but wide Blue cruise which we follow down to La Ruelle (1600m). It’s in every sense a blast – all the way down we’re skiing against a strong, bitterly cold headwind. When we reach the bottom we decide to take a chocolat-chaud break, thaw out and make the most of the views. Just above us across the valley we can make out the fortress-like dam of the Lac de La Girotte, whose frozen surface had been far below as we left the Col just minutes earlier. As soon as we’re suitably revived we snap into our skis once again and schuss sedately down to the welcome sight of the Col chairlift. In better conditions we’d have continued all the way down to Belleville 1200 for a return gondola-ride, but with hostile-looking clouds rapidly heading our way we don’t hang around before taking the high-speed four-seater for a glacial haul back up to the Col du Joly. At the 2000m ridge the wind is blowing harder, and the lift operator at this remote spot must be in no doubt that this will be a short day for him and his companions spread around the mountain. From our point of view, we’re just glad that we did at least manage to see something of the Hauteluce sector, an area we usually approach from Les Saisies on the far side of the village itself. The Beaufortain looks a picture in fine weather, but as today has already proved, sometimes the sense of adventure of skiing in less-than-perfect condition brings its own rewards. As we drop back down from the Col visibility comes and goes, but so far hasn’t decided to clamp down altogether. Taking this as a good omen, we join the Jonction four-seater chairlift at its low mid-station (the lift operates in both directions) for the first stage of a ride all the way up to Aiguille Croche, at 2487m the highest point in the ski area. The next is the four-seat high-speed Tierces lift, which, believe it or not, replaced an almost 2km-long haul by drag-lift (originally a T-bar). 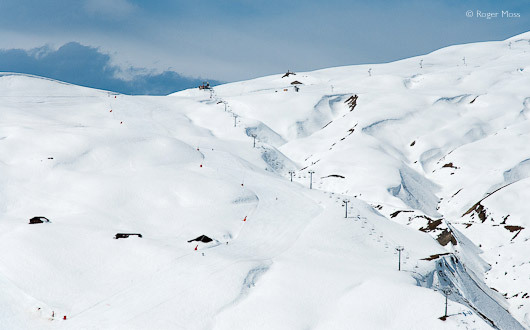 In 1995 the new lift finally opened this rewarding area up to intermediate skiers, along with the topmost terrain served by a four-seat fixed chairlift. At the top we get to see little more than fleeting glimpses of the vastness all around us, but it’s still hugely impressive. It’s also becoming windier by the minute, so the nearby drag-lift up to the Black-only terrain below Veleray (2450m) is closed. In these conditions we’re hardly complaining, and set off on a long Red- and Blue-graded descent which eventually brings us right back to the Col lift mid-station. This time we join in the opposite direction and find ourselves heading calmly back up to Signal (1900m). At the top it’s still sunny and feels a lot less exposed but gusting winds have nevertheless closed the gondola which runs along a ridge. Sadly we haven’t managed to take in the Gentianes piste we’d planned on skiing to explore the gully between here and the Aiguille de Roselette, but on the gentle cruise back to Etape 1470 we know we’ve crammed a lot into a very unpromising morning’s skiing. During the gentle gondola ride back down to La Gorge our cheeks are burning and our hands tingling. 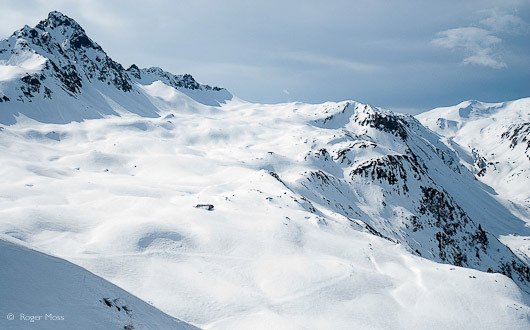 But it’s as nothing compared to the highlights we replay in our minds – it all adds up to the kind of tantalizing glimpse into just what Les Contamines offers skiers with the desire and imagination to try something just a little away from the mainstream. Les Contamines-Montjoie is part of the Evasion Mont-Blanc ski area incorporating Megeve, Saint Gervais, Saint Nicolas de Veroce and Combloux Le Giettaz. Les Contamines is not linked to other Evasion Mont-Blanc resorts so if you want to make the most of the Evasion Mont-Blanc ski pass it’s best if you have your own transport.